Agile is a trend that is emerging fast as a radical shift from the traditional software development models. Agile facilitates integration of development and testing activities from the very beginning of the project. Agile methodology does not follow a sequential approach but rather it emphasises on continuous improvement to the overall software development activity. An agile testing strategy is to prepare a test plan which includes determining the testing scope, identifying the functionalities to be tested, types of testing to be carried out based on the extent of intricacies of features, load testing, forecast potential risk involved and setting the milestones to be achieved. After a careful consideration of the given facts, agile test plan must set out on its execution path. 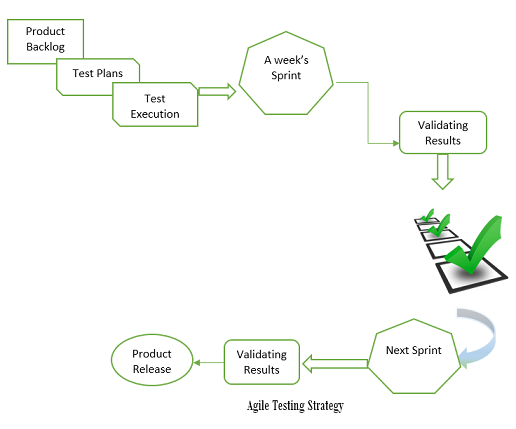 Following is a step by step process of how agile testing process is carried out. Initiate project - The very first step is to conduct the set up tasks that are required to proceed towards the next consecutive steps. This involves identifying people for testing, installing testing tools, scheduling resources, etc. Construct iterations - The second phase is to construct iterations, that is, to build an iteration model to flip through the various activities during the software development phases. This can be classified in two parts i.e. confirmatory and investigative testing. Confirmatory testing conforms to fulfilment of system requirements by the stakeholders. Whereas the investigative team detects the problem which might have been skipped by the confirmatory team. Release Phase or transition phase - It includes training of end users so that the system can be deployed successfully. It involves activities like system and integration testing. Production - After the product has passed the release stage, it enters the production stage. Data field checks - Check for conformance to field specifications, that is, for date, month, year. Numeric field checks - Numeric format must adhere to the specific fields, that is, invalid or valid value checks must be done to ensure user authentication. Alpha field checks - Check for blank or non-blank data, check for the range of highest and lowest values, valid or invalid character symbols etc. Defect Checklist - Track the defect log with steps to reproduce defects so that we may analyse and debug the defect. Specify the tests to verify the defects and thus execute tests to verify it. Planning readiness Checklist - This consists of a preparatory task that should be completed before starting a plan. Pre planning offers an effective way to deliver output. Define agile team and assign roles and responsibilities to the members. Workshop Checklist - A complete sequence of tasks are prepared which are supposed to be completed within a definite time period. Ready Checklist - By this stage the previous tasks must be completed prior delivery of the product.